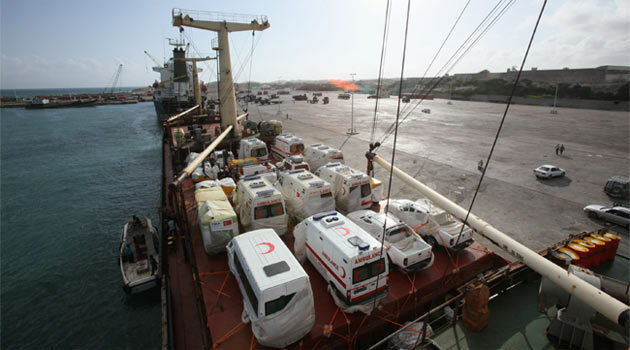 Turkish merchant ship M/V Burak A. carrying 5.000 tons of humanitarian including 8 full equipped ambulances, 1 forklift, 5 jeeps, 6 generators, 500 tents, 5000 blankets and 4.500 tons of food and medical supplies arrived in Mogadishu . The ship left Istanbul on 16th August and escorted by the frigate F-494 TCG Gediz all the way. After escorting M/V Burak A. away from dangerous waters the frigate will join the CTF-151. On the same day a 213-member high-level delegation from Turkey completed a one-day visit to Mogadishu to learn the needs of Somalia and explore business opportunities in the country. It is the largest such delegation to Somalia since 1991.